While growing up, Russ’ mother called any dish that was thrown together with leftovers “Slumgullion” (see History of… at end of post.) So this pasta dinner is a creative twist on that concept. One Thursday evening (our typical leftovers night), I needed to throw together a quick meal made from available ingredients. Taking inventory of the freezer the evening before, I noted we had some chicken sausage links with sun dried tomato and basil, so out they came to thaw overnight. Slit casings down length of sausage links. 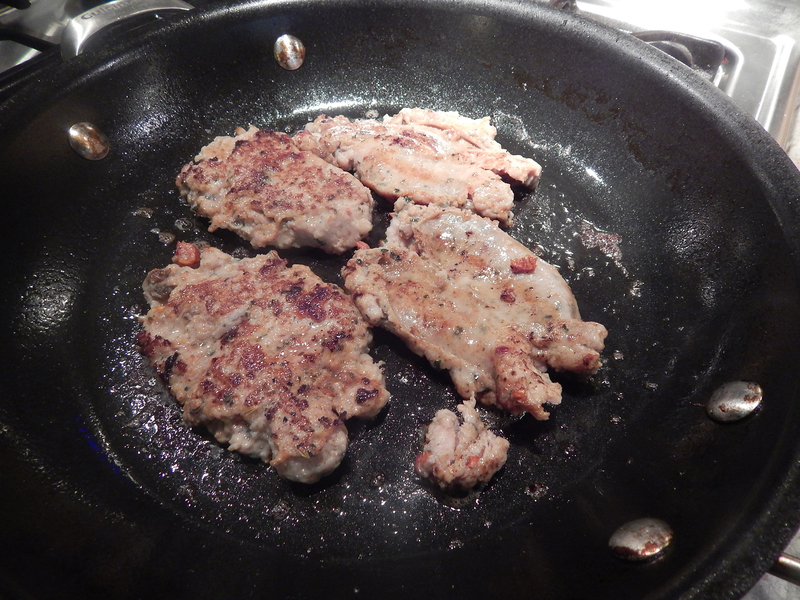 Brown in skillet over med-high heat until cooked through on all sides. Remove to a side dish. 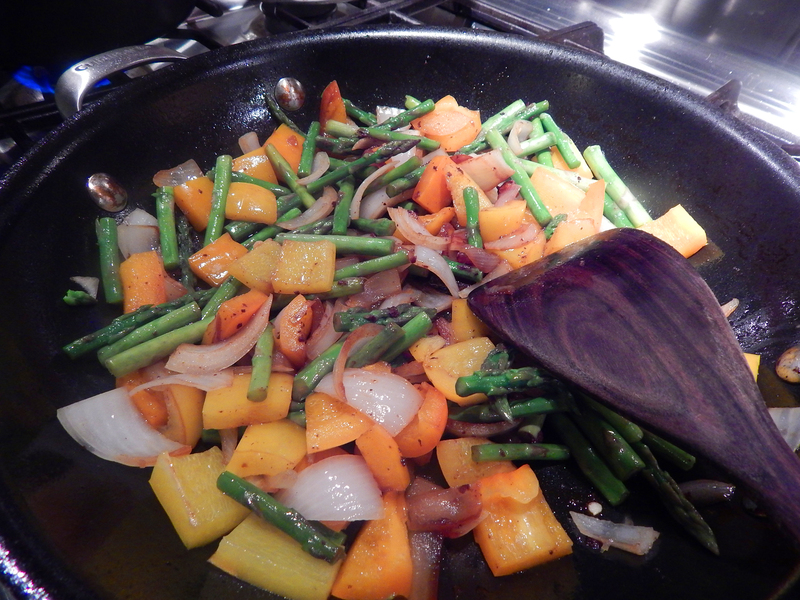 In the same pan at medium heat, add the roasted or minced garlic, asparagus, peppers, and onion; cover for about 5 minutes. Lift the lid and scrape the bottom of the pan with a wooden spatula to loosen the browned bits. Cover, lower the temp, and continue to cook a few minutes more. Meanwhile, crumble the sausage links to about a 1/2″ size and add to veggie mixture until all is heated through. As pasta is draining, add the grape tomatoes to the mixture for one minute. Combine all into a large pasta serving bowl, drizzle with good extra-virgin olive oil to taste; add grated cheese and chopped fresh herbs. Serve into separate bowls. 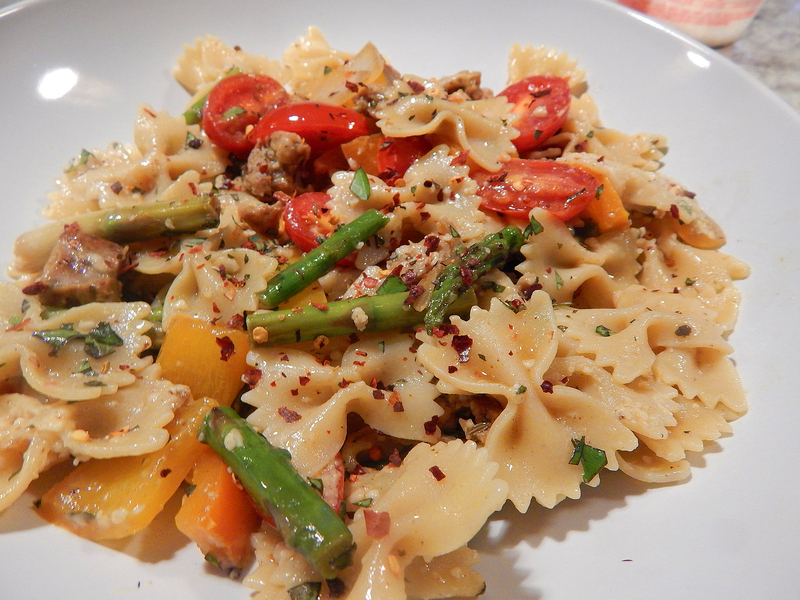 And, no surprise, I sprinkled mine with some crushed red pepper! Place three or four heads of garlic on tinfoil and drizzle with olive oil. Wrap up and place in heated oven. Cook for 1 hour. Remove from oven and let cool while still in the tinfoil. Once cool enough to handle, remove the papery skins and squeeze the roasted garlic into a lid-tight plastic container. Add enough olive oil to cover. Keeps for months in the refrigerator. NOTES: The past several times I have put the roasted garlic and olive oil into a mini food processor to combine the ingredients into a paste. Any olive oil that separates, can be used as desired for a host of cooking options. The history of slumgullion seems to be that it came from the slums of England before the turn of the century. There was no recipe recorded because back then very few new how to read or write. It was handed down to the kids by showing them how to make it, they just used what they could find or had, there was not much meat so if they had some rats or mice or sparrows or pigeons, what ever, they used it. If they lived buy a slaughter house you can guess what they used. They would put the meat in the water and added onion and salt to kill the odor of the meat cooking , then they added some veggies and thickened it with flour. When it was thick they would serve it over potatoes or buy itself. In later years in some areas, it was called MULLIGION and served over mashed potatoes or put in a shell pastry and called a mulligion pie. Just like the old saying goes 5 and 20 black birds baked in a pie.